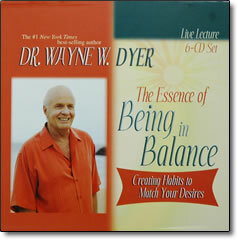 The Essence of Being in Balance – CD by Wayne Dyer – Discount! In this live lecture, Wayne emphasizes that we’re a vital component of this creative process and have within ourselves the wherewithal to create all that we want if we recognize and revise out-of-balance thoughts. Dr. Wayne W. Dyer shows you how to restore balance in your life by offering nine principles for realigning your thoughts so that they correspond to your highest desires.